A deeply rich dry curry, created with adult consumers in mind. Contains chicken. Cooked in a kettle over an open fire, the rice is soft and fluffy. Simply cook for 3 to 4 minutes in a frying pan or microwave and enjoy. Dry curry is a type of Japanese-style curry made with a thick sauce. This dry curry is deeply rich, and was created with the palate of adult consumers in mind. It was made using leg and breast meat from domestically raised chickens (10%). The rice was cooked with seasoned liquid as well as curry powder, imbuing the rice to its very core with flavor. Cooked in a kettle over an open fire, the rice is soft and fluffy. To cook the dry curry in a frying pan, add a little oil to the frying pan and heat. Then, add the dry curry (still frozen), and cook at medium heat (1 bag: 3 to 4 minutes). 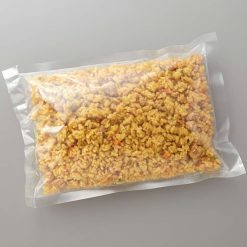 To cook the dry curry using a microwave, place the dry curry (still frozen) on a flat plate, and cover with plastic wrap. In a 500W microwave, cook for 4 minutes 30 seconds. In a 600W microwave, cook for 4 minutes. If the dry curry is still cold after microwaving, continue to microwave in increments of 10 seconds until it becomes warm. Cooking times will vary depending on the model of microwave and the amount of food being microwaved at one time. Please microwave with care. This product contains polished rice, chicken meat, vegetables (onions, carrots, bell peppers), rapeseed oil, soy sauce, spices, tomato paste, table salt, sugar, kombu seaweed extract, (contains wheat).. 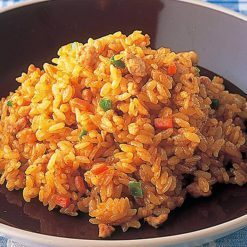 Origin of ingredients: rice, chicken meat (domestic). Prepared and packaged in Japan.